Love those monkey feet! We stay in our jammies until we MUST get dressed too! I am grateful for the days when there are no MUSTS! I love all your pajama's.. Isn't it just so cozy to stay in your pj's until you have to get dressed.. I do my best cleaning with my pajama's on. Somedays it's noon and I'm still not dressed.. Life is good~! have a tiggeriffic day~! ta ta for now from Iowa...Yikes it's -5..
Glad we aren't the only ones that stay in our jammies. Usually DS does get dressed (well, sometimes half way) since we just potty trained, and he does pull-ups at night, so we do the switcheroo in the mornings and sometimes put pants on him instead of jammies. But keep the jammie shirt on. Very fun, I love the pics and even more, I love that you enjoy your children! I love dancing with my kids! Plus, it's a really great workout. I LOVE your jammies! Did you make them or buy them??? So cute. :) We stay in our pajamas way too long around here... There's no point in getting dressed if you're going to take a nap in a few hours, right? So sweet! Little kids and music are a great combo. Our little guy has his own little jam space set up and if we stop watching him for a moment he races over to the stereo and cranks it up and starts dancing. Priceless. i love that they love to jam with you! If I'm singing half the time my three year old daughter looks at me totally deadpan and she's like, "Mom... stop singing. You're giving me a heg-ache." That is classic Cheri. Jammies-- too funny. I love that your boys seem to have a dash of your sweet sweet music love. It's just what you needed. LOVE IT! My kids love the special treat to stay in their pajamas and I figure since I stay in mine pretty much all day, they deserve it, too. 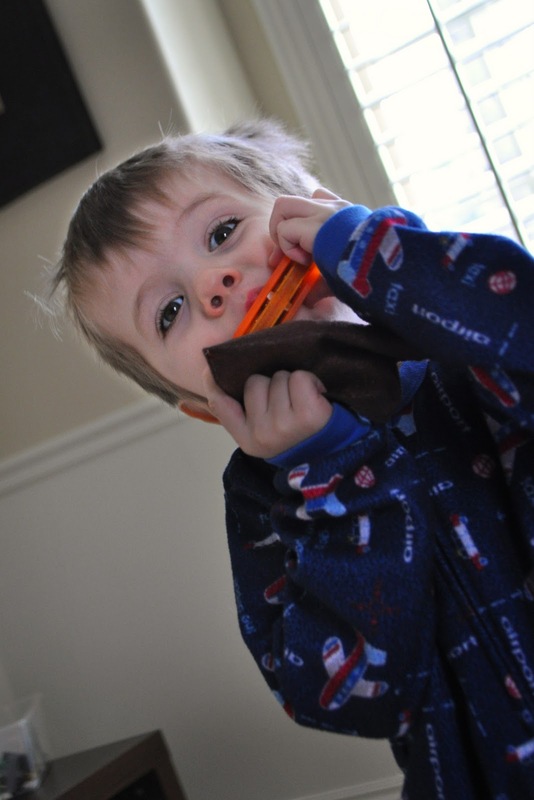 Little kids on harmonicas are awesome! It's impossible not to hear them coming up with great tunes and rhythms! Love it! Becky - The sleeper in the picture is from Target. They carry them right before Christmas.